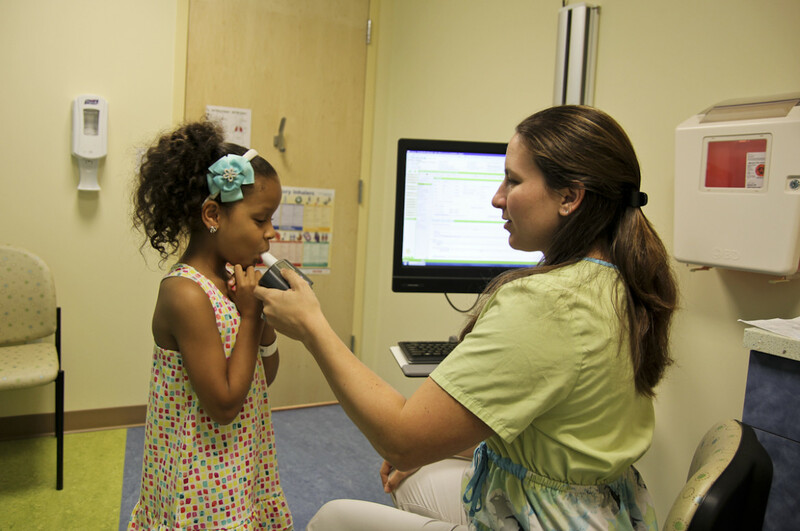 Megan Judkins, a nurse, helps Ariana Gomez, 7, test her breathing. Ava Passley covered her nose and giggled as Dr. Jacob Hen walked into an examination room at his pediatric pulmonology office in Trumbull recently. Ava, 3, of Bridgeport, knows what to expect from a visit with Hen, having dealt with asthma since she was 1. She also spent several nights in the hospital after an attack in 2012. “I had always heard about wheezing, but had never really heard it before that,” her mother, Beverly Passley said. Ava is part of growing number of people in Connecticut who have used the emergency room for asthma symptoms, according to the most recent figures from the state Department of Public Health. Each year from 2005 to 2009, Connecticut residents with asthma symptoms on average visited the emergency room 22,000 times, and were hospitalized 4,800 times. The reasons vary: some are new asthma patients, some have new conditions that trigger their asthma, and many just poorly manage their medications, doctors say. The visits made up 1 percent of total hospital health care charges in Connecticut in 2009, at a cost of $112.8 million. Medicare and Medicaid paid for 73.8 percent of the hospitalizations and 60 percent of the emergency room visits. The increase is being watched by officials in the state health department, researchers at Connecticut universities and community environmental groups, as they look to help people better manage the disease, while saving money on preventable hospital visits. And yet, the most recent numbers show that the situation is getting worse — especially for minorities and people living in urban areas. In 2012, the state DPH published “The Burden of Asthma in Connecticut,” which reviewed data from school asthma tracking programs, death certificates, federal labor reports, Centers for Disease Control and Prevention surveys, state Medicaid data and hospital records. The 166-page report reviewed data from 2000 to 2010. During that time, the rates of people who were hospitalized for asthma increased by 29.2 percent. For those who listed asthma as the secondary reason for hospitalization, the rate jumped by 86.2 percent. Rates for people living in urban areas were much higher than their suburban and rural counterparts. In New Haven, Hartford, New London and Bridgeport, residents were hospitalized for asthma symptoms twice as often as in nearby suburbs. In New Haven, for example, the age-adjusted hospitalization rate between 2005 and 2009 was 63.4 people per 10,000. In adjacent West Haven it was less than half that, at 31 people per 10,000. East Haven’s rate was even lower, at 23.4 people per 10,000. At the same time, Hispanic and black asthma patients showed much higher rates of hospitalizations than the overall average, and than subgroups of patients who are white or other races. In 2009 alone, white asthma patients went to the emergency room at a rate of 34.2 per every 10,000 people. Black and Hispanic patients had rates of 127.3 and 170.5 respectively. What makes minorities more likely to visit the emergency room? They start with higher rates of asthma, according to national and state data. Much of that can be attributed to environment. Cities, which have high minority populations, are filled with various asthma triggers such as air pollution, mold, cigarette smoke and even proximity to rodents. Veronica Tate, 66, said she developed asthma when she moved to Hartford two years ago. “Last August, I had this tightening of my chest,” Tate said. Her doctor thought it was allergies, and prescribed some medicine. But it kept getting worse. Many assume people use the emergency room because they lack health insurance. But as more people gain access to insurance, and the numbers of emergency room visits continued to rise, the Connecticut Coalition for Environmental Justice started asking people why they kept going to the emergency room. The reasons, Lewis said, came down to the quality of health care people said they were getting at community health centers. The main problem, Lewis said, was the lack of comprehensive services at community health centers. If a patient needed an X-Ray, he or she had to travel to another center where they have the equipment. For someone without much money or a means of travel, the cost of taking public transportation to one, maybe two, maybe three other centers was daunting. “If you go to the emergency room, it may take 12 hours, but when you leave you’ve got everything done,” Lewis said. Of the 110 people CCEJ interviewed, only one person said she didn’t have health insurance. “We need to think of the entire chain of things and how they work before you say people are using the emergency room for the wrong reasons,” Lewis said. Other researchers have found that a poor relationship with a primary care doctor can lead patients to wait until symptoms are severe before seeking help. Dr. Kenneth Robinson, the medical director at the emergency department at Hartford Hospital, said he doesn’t ask patients why they opted to come to the hospital. “Generally in my mind, the complaint of acute shortness of breath is a very appropriate reason to go to an emergency department,” Robinson said. 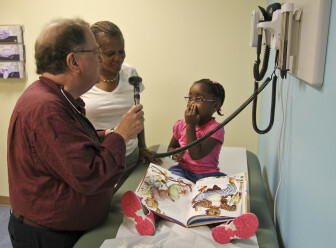 Hen, the chief of pediatric pulmonology for Bridgeport Hospital, and also affiliated with Yale-New Haven Children’s Hospital, stood in the waiting room of his office recently, waiting for his next appointment — a child in the state HUSKY program being treated for asthma. It gets him, because Hen sees the quarterly visits as the way to keep the children out of the emergency room. “Part of the reason we see asthma kids every three months is to reinforce the education, reinforce the care plan, that you have to stick to your medication,” Hen said. Some of his patients have ended up in the emergency room. When he looks through their records, Hen said he finds they are the ones who have multiple no-shows, or haven’t scheduled an appointment for eight months. Dr. Jacob Hen examines Ava Passley, 3. Ava’s mom, Beverly, looks on. Hen said that regular treatment of asthma symptoms could prevent about 130 children’s deaths each year nationally. Hen said community programs are one solution to the problem. If trusted community members can reach families in their churches, at school, then the education might be more likely to resonate, he said. Several efforts are underway across the state. Putting on Airs, a statewide program run by regional health districts, sends health inspectors into the homes of asthma patients. Mary Buckley-Davis runs the Putting on Airs program for the Ledge Light Health District in New London. She said she helps families identify triggers such as mold, scented candles or areas where dust mites can affect a person with asthma. Sometimes she just goes over the medications patients are using. Some simply mix up their daily medicine with their “rescue” medicine. Some are not filling the prescriptions. But that extra help can make a big difference. A state review of the program found a decrease in the number of emergency visits to a doctor or hospital for asthma six months after a home visit. A majority of clients said they were missing less work and school because of their symptoms. Another state program focuses on the need to get asthma patients set up with action plans. The Easy Breathing Program includes a questionnaire doctors can ask to help determine if patients have asthma, and get them on a treatment plan. The costs include training medical providers. While prescription costs increased for children in the program, the cost of hospitalizations decreased, especially for chronic asthma sufferers, according to a 2009 study by researchers at the Connecticut Children’s Medical Center in Hartford. Passley has a color-coded guide to track Ava’s symptoms and respond with the appropriate medicine. On a normal day, when Ava is in the green zone, she’ll take a morning nasal steroid spray and a morning and evening pump of inhaled beclomethasone. If Ava hits the yellow zone — which can happen as triggers come on, or when she gets a cold or other illness — the doses increase, and she might also need a liquid steroid. The red zone includes worsening symptoms, and that means it’s time to go to the emergency room. A website in Spanish on asthma is available here.